The wrong color of frame was sent. Contacted Customer Service and have not heard back. Thank you for taking the time to submit your review. I appreciate you speaking with me today over the phone. We have agreed that you are sending us photos of the frame you have so we can confirm if you received the wrong frame. We have presented you with the option of keeping the frame or returning the frame. Either way, we want to accommodate you. Keep in mind if you respond to the shipping confirmations, we do have visibility of your response. That is the reason our response was delayed. We look forward to speaking with you soon. Happy Framing! 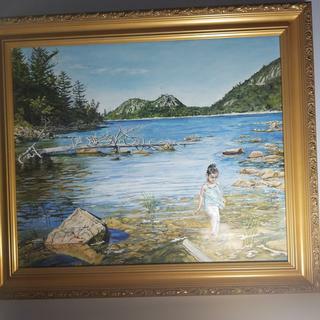 I've been getting frames from PictureFrames.com for years. Their frames are always wonderful. 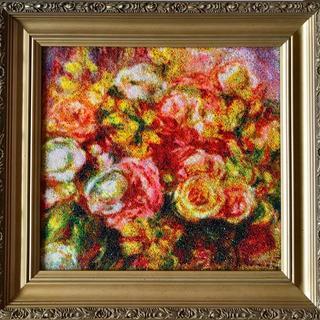 I am an avid cross stitcher and I use their frames for my finished pieces. 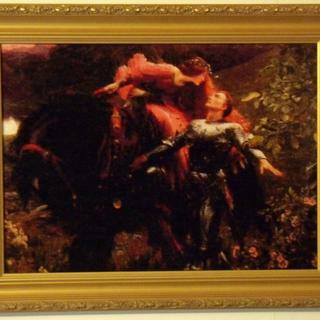 This Renoir frame is the perfect complement to my stitched version of La Belle Dame Sans Merci. My cross stitched version of La Belle Dame Sans Merci (pattern by Heaven and Earth Designs). Beautiful, kind of frosty shade of gold. Looks amazing. Thank You pictureframes for outstanding service! Beautiful frame! Kind of frosty shade of gold, looks perfect! Thank You for outstanding service! It's a more substantial and solid frame than I was expecting. It's a more substantial and solid frame than I was expecting. Very good for the price. I am slowly replacing a lot of old art and lithographs with new frames. And, because so many are European, their sizes are all crazy compared to US standard frame sizes. Perhaps due to centimeters vs. inches? Anyway, this site is a Godsend for ordering customized frames with goofie sizes up to 1/8 of an inch. I just wish the shipping costs were not so much. The frame is well cut from solid hardwoods. Lovely finish with the gold paints. Accurately cut. The glass came clean and polished. And, the mounting hardware was exactly right. I will use them again. Thanks! 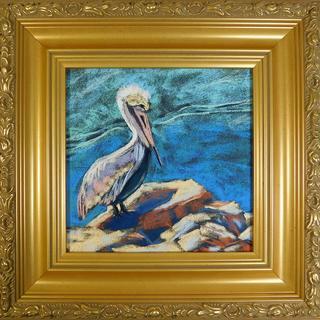 My clients loved the pastel painting, but also commented on the beautiful frame. I loved it too and felt good sending my art out in such an elegant frame. They loved my painting, but also commented on the beautiful frame. This frame is gorgeous. The mat I ordered and backing is perfect for my art. I have bought many frames from this company that I have loved, but this one looks like gold plastic. I am very disappointed. Thank you for your review Erin. We sincerely apologize that the frame did not have the appearance you expected. The frame has a gesso finish which is an overlay on the wood. The overlay is not plastic, however, it does have a satiny texture. Please give us a call so that you may return the frame or exchange the frame. We can be reached at 1-800-332-8884. We are happy to offer you a full refund. Your review will help us maintain the high level of quality we desire to have. Thank you for your business. Ornate but not too ornate, nice depth. 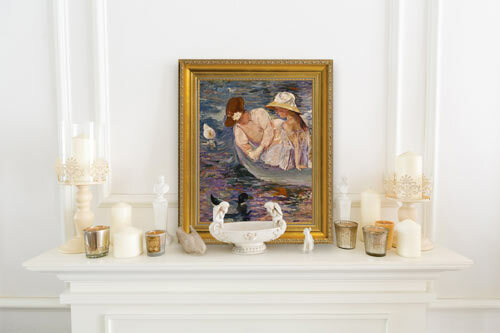 This frame was recommended by the artist whose painting will be framed in it. 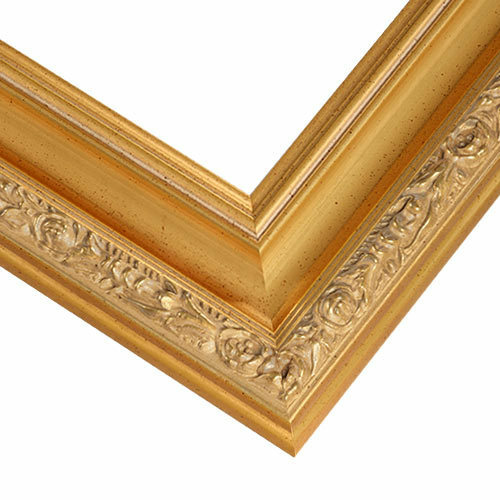 I have also ordered this frame before and was pleased with the low-key profile of the frame, and with the detail at the edge of the frame. The painting is darker so I chose gold to make this pop a bit more. It's an old painting with odd sizes (I suspect it's in centimeters not inches) since this is an old French painting I am going to frame. Closely matches Thomas Kinkade framing. Love the frame, makes the painting look great. Exceptional value, museum quality look and feel. It went with the picture and a similar frame that I have. I have a canvas with a 1 inch rabbit can I use this frame anyway? Is there special hardware needed? The rabbet depth of this frame is only 3/8" so, unfortunately, your 1" canvas would stick out in the back. Some customers don't mind this when the frame moulding is wide. You can always order a free 3" sample of the frames you are interested in to see them against your canvas for a better 3-dimensional view. If you have any additional questions do not hesitate to contact our friendly framing experts at 1-800-332-8884 or via LIVE chat.